Structure of guinea pig BLT1 bound with a BLT antagonist, BIIL260. 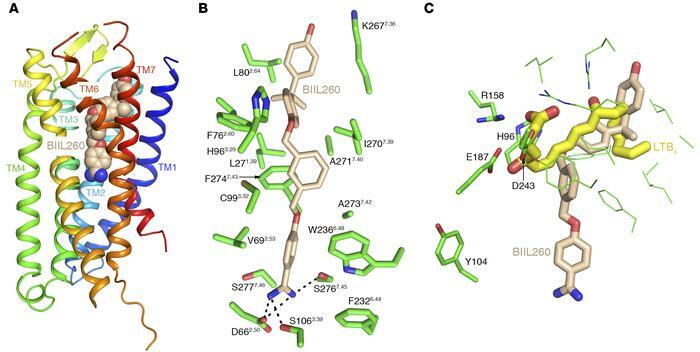 (A) Overall structure of BLT1 and BIIL260 complex (35). BLT1 is presented as a rainbow-colored cartoon model, and BIIL260 is presented as pink (carbon), blue (nitrogen), and red (oxygen) spheres. (B) Mode of BIIL260 binding by BLT1. BLT1 side chains within 4 Å from BIIL260 are presented by stick models. Carbon and sulfur atoms of BLT1 are colored green and gold, respectively. The salt bridge and hydrogen bond interactions are indicated by black dashed lines. (C) Docking of LTB4 in the orthosteric binding site of BLT1. The docking study was performed with the program AutoDock 4 (184). Carbon atoms of LTB4 are colored yellow. The residues involved in the LTB4 binding shown by the mutation study (36) are presented by stick models.